One of the most frequent questions I get is whether clients should do a baseline telomere test before starting TA-65. It is only my case, but I will share my results from the last 11 years in this post. I generally tell people that measuring telomeres isn’t necessary. In general, people tend to have a decrease in the first year and then stabilization and regrowth but there is a lot of variation in my clinical experience. More importantly, there is good news: the mechanisms that trim telomeres is still intact and there isn’t unopposed lengthening, which would be bad as well. In the larger scheme of things, I believe that effects of biological aging, enhanced by stress, certainly overwhelm the effects of a telomerase activation. Teloyears, a blood stick using quantitative PCR for $89 came back very poorly. It was 0.78 which put me in the bottom 9 percentile for my age of 50. This was my first result with them. The lab with whom I have had the most tests since 2007 has been Repeat Diagnostics, in Canada, that uses a flow FISH technique. That result was 8,200 base pairs, still excellent compared to my cohort. The Texas-based Spectracell, using the same TeloYears qPCR technique, put me in the top 1% of my age group at 11,850 base pairs. So there we have it. If you step on four scales and they read 60lbs, 82lbs, 118lbs, and 124 lbs, you would say, “scales aren’t very accurate, are they?” If you look at the table below at my simultaneous 2015, results, they were also quite divergent. 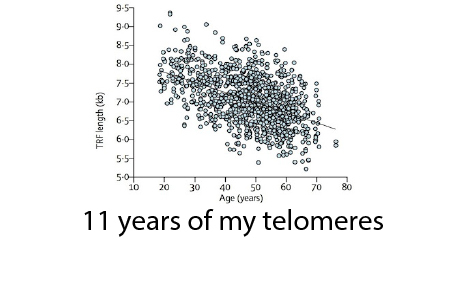 Now let’s dive a little deeper into the actual data after reviewing this graph from my book, Telomere Timebombs. Careful readers will note that the later results come from the flowFSH Life Length test, which may invalidate this graph. Let me say first that I have a high degree of confidence in the repeatability and quality control of the labs. Year over year, the results are comparable. What are my general conclusions? With Repeat diagnostics, I think the methodology has been consistent and over the last 11 years of taking a telomerase activator, my median length according to them has been 900 base pairs, or roughly twice the expected loss! According to Life Length, my telomere length over the last four years my median telomere length has decreased from 13,800 to 12,400 or more than the expected change of about 160 base pairs. According to Spectracell, my telomere length over the last three years has increased from 9,500 to 11,850 base pairs. Finally, my UCLA immune aging test shows that I have definitely aged although my immune system is excellent compared to those my age. My naive (good) T-cells are down from 350 to 243. My burned out T-cells are up from 24 to 104. The real question is whether the last ten years, which have been stressful, would have been better, worse, or no different than if I had not taken telomerase activators. My conclusions from a clinical standpoint are that I still get mistaken for 4-8 years younger, which is also what my epigenetic age showed. I have very few grey hairs on my head and no longer need reading glasses. If I’m being honest, taking telomerase activators appears to have not increased my objective telomere length as I’ve become older, although one of four labs thinks so. That said, my results are still enviable compared to people my age if you leave out the TeloYears result. And clinically, I feel fine. 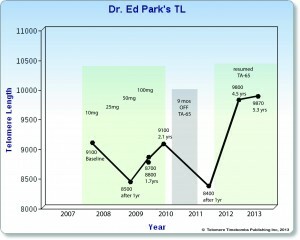 Read this blog to learn more about the randomized clinical trial showing improvement in the low dose TA-65 group of 8mg daily. My best guess is that taking telomerase activators, like everything else, is a mixed blessing when you ignore the obvious clinical benefits. It seems to slow and even reverse some signs of aging but since there are mechanisms for telomere trimming and certain epigenetic and genetic mutations may accumulate when stem cells survive longer, the net benefit may only be a slower attrition of the source of stem cells. If the ability to maintain stem cells is increased, that can be good and bad. When we have the ability to control the other two aspects of stem cell ecology, that is birth and death, we will be closer to managing aging. I don’t recommend starting or stopping telomerase activators based upon telomere tests because they vary so much unless there is a massive and repeatable increase or decrease. Otherwise, if you are feeling well, stay the course. Very curious isn’t it. That the results objectively are essentially unmeasurable. The results experientially however are quite satisfactory for you personally. I wonder at what point does the therapy (dose) become irrelevant in comparison to the perceived experiential benefit. In other words, small dose once a month unless you’re feeling old, then once a day for a week or until you feel younger ( for example). Ed, surprising how well I feel for 79 1/2. and I am judged much younger in age. What seems evident is that telomeres are just one of many aging systems/processes. Others are hormonal, and many we have yet to understand. What’s clear is that death is very important for the survival of almost all species, hence multiple overlapping processes have evolved over time to ensure that it happens. I believe that telomere attrition is the final common pathway that permits aging by mutation. That leads to inflammation and dysfunction.